Our Most Expensive Home Improvement To Date! 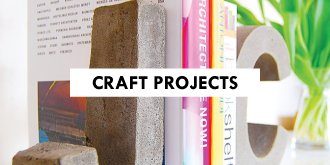 Yay, the first project on our list of projects for 2016 is already complete! If you follow us on Facebook you may already have an idea of what it is, as we couldn’t resist sharing a behind the scenes shot of it in progress. Can you guess what it is? … and this is what it looks like now! Yep, we’ve had bi-fold doors installed! 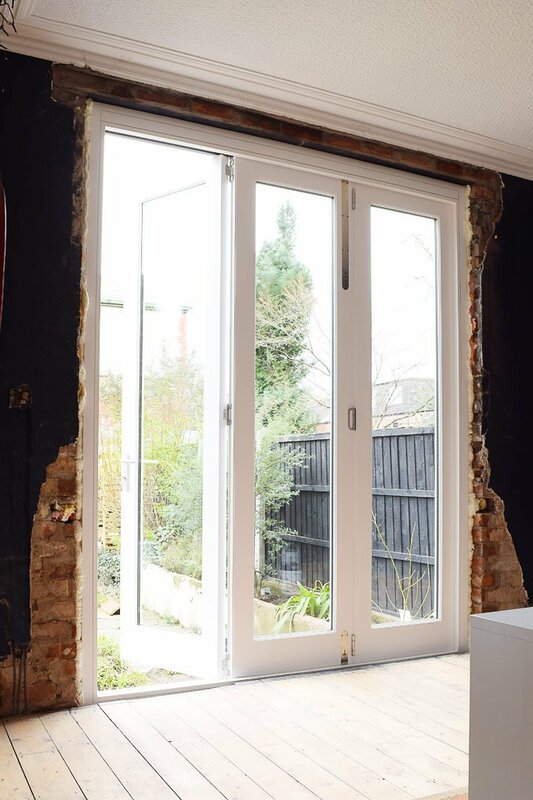 Even from the first moment we viewed the house we knew that we would love to install bi-fold doors where the existing patio door was. 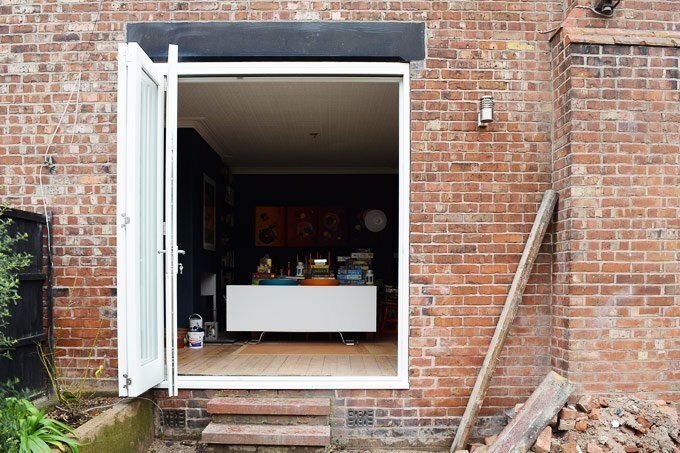 We knew that we could create a fab open space if we knocked down the wall between the kitchen and dining room (we did that back in 2013) and installed bi-fold doors that lead on to a decked outdoor area. 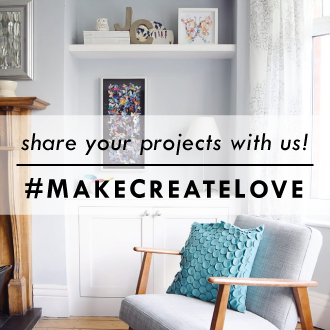 It’s actually one of the first projects we got estimates for when we first moved into our house over 5 years ago, but it quickly got put to one side when the quotes started to come in and we had about a million other projects that needed sorting first. It’s definitely a project that I now wish we’d been able to do sooner. Inevitably a few other and more important home updates like repairing the roof (it was raining in one of our bedrooms), stopping our heating pipes making noises that kept us up half of the night (admittedly a surprisingly cheap solution) and repointing the back wall of our house were more of a priority. Yes, we still have about a hundred other areas that we need to spend money on but hey, you have to have a splurge every now and then! 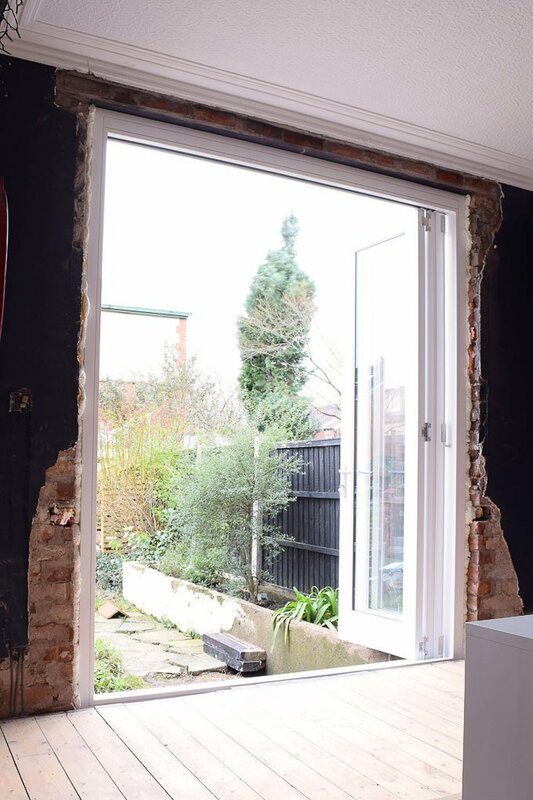 Windows are an expensive home improvement and whilst this patio door would have needed replacing either way and although that we think that the doors are totally worth every penny, it really was a painfully expensive house update. Needless to say we’ll have to stick to a few smaller home improvement projects for a while as we’ve completely blown our budget. 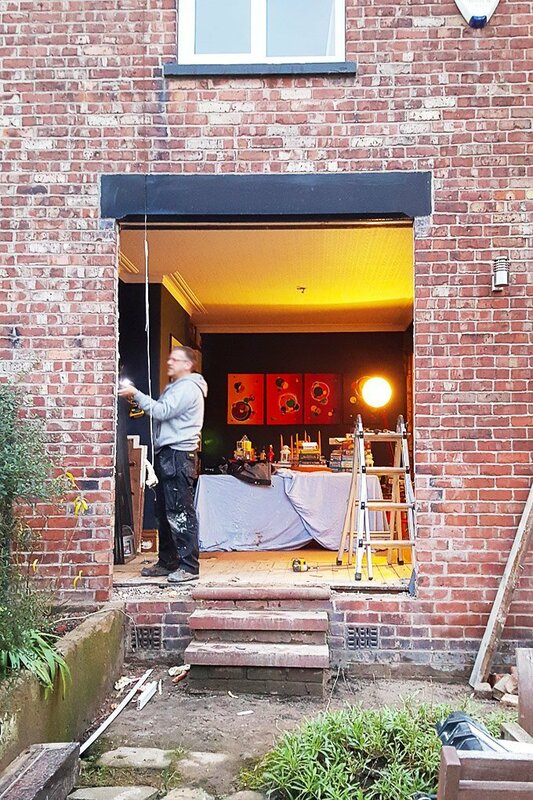 Before we could actually have the new bi-fold doors installed, we had to get a bit of building work out of the way first. 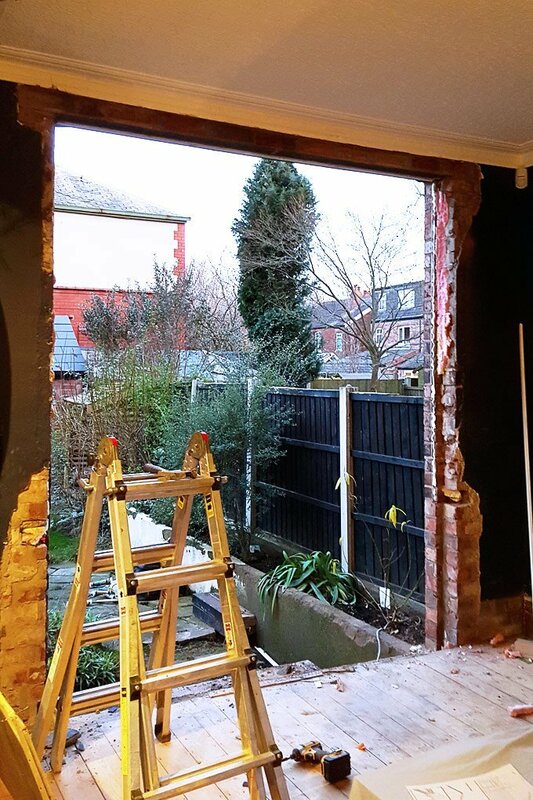 The wall under the both of the windows had to be removed and tidied, we had a course of brickwork removed so that we could have a flush opening and we had to have the lintel over the opening replaced. As always it’s great to see progress, but knocking two big holes in the exterior wall when it’s 0°C outside did seem kind of mad. Although our window opening isn’t overly wide, it is really high which is one of the reasons that this project turned out to be an expensive one. 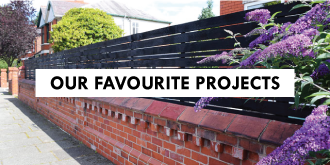 Don’t get me wrong, it’s not as if we’ve not spent a lot of money on other projects in our home, but this is easily the single most expensive project that we’ve done to date! There’s obviously still a lot of work to do, but we love the transformation. 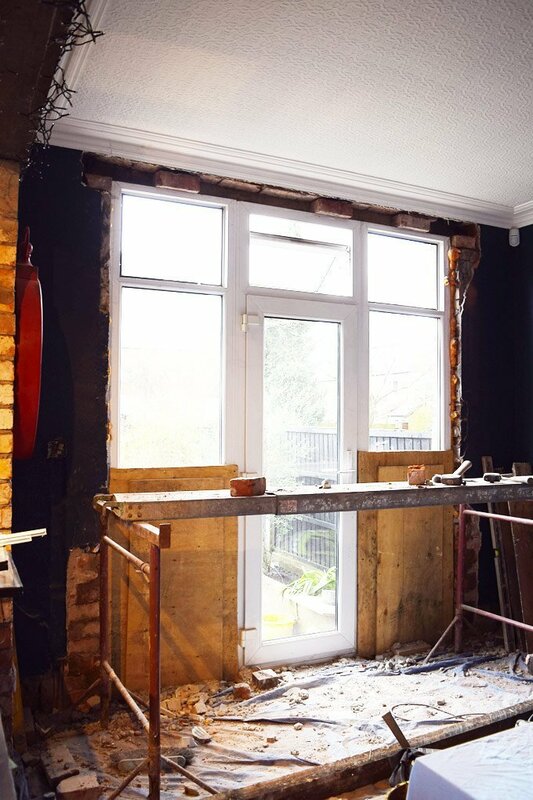 We still need to plaster the wall around the new window, repair the floor and install the skirting & architrave. Overall though, it already looks so much better than before. It’s actually weird how different the whole room feels. I would say that I’m fairly good at imagining what a space will look like, it is always a relief when the vision and reality match up! 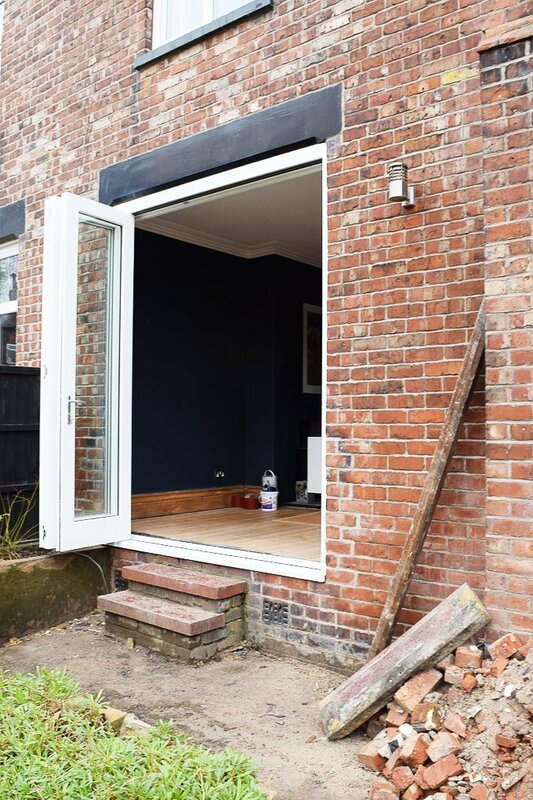 The ultimate plan is for the doors to lead through to an outdoor decked area which will give us an extended living space. 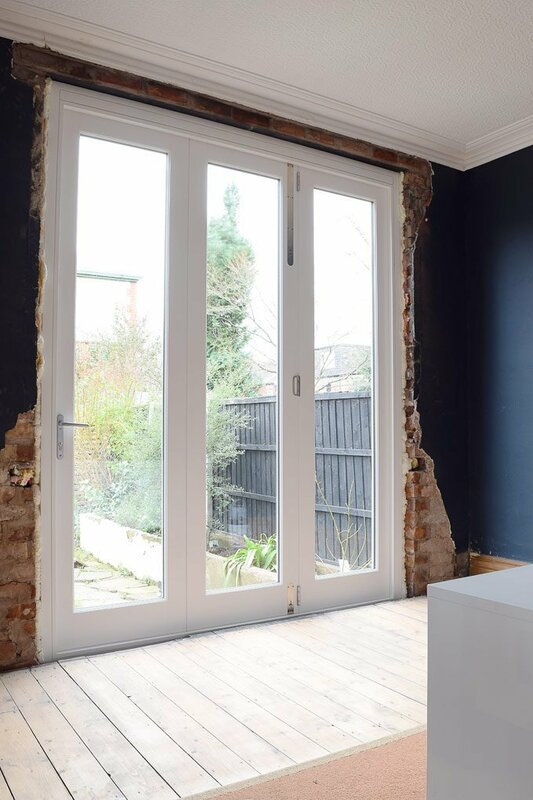 The new doors are made of accoya which is a super durable and dimensionally stable wood which means that the doors shouldn’t warp and should run smoothly for years to come, which was inevitably one of our biggest concerns given the height of the doors. 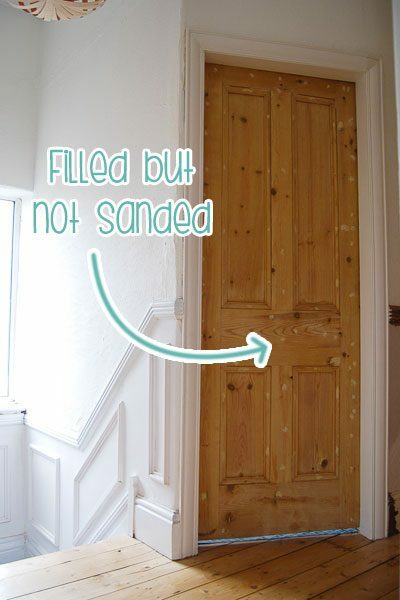 Another big consideration when choosing the door was the threshold. 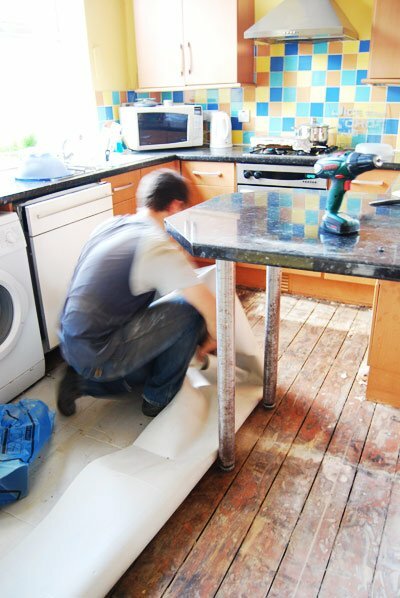 We wanted a completely flush finish between the inside and outside, but as level thresholds aren’t guaranteed to be watertight, we opted for a standard threshold instead. 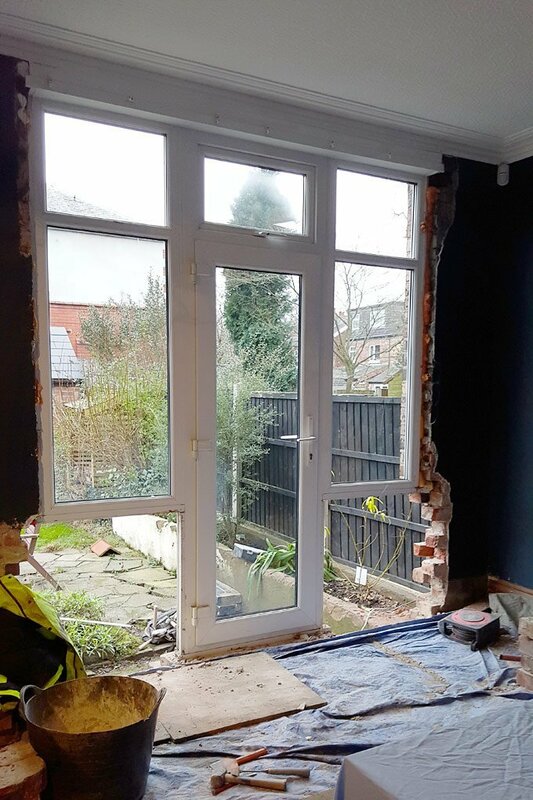 Luckily we found an alternative and by removing one course of brick we were able to lower the door so that we’ve managed to get a flush finish after all! I know it’s only January, but we already can’t wait for the weather to improve and actually be able to make the most of the doors by opening them up. We have a few more big changes planned for this space in the first half of the next year (which finally includes a new kitchen! ), so stay tuned. 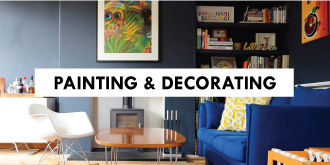 Given that we now see much more of our messy garden through the new doors, I guess that sorting it has also jumped up our list of priorities! 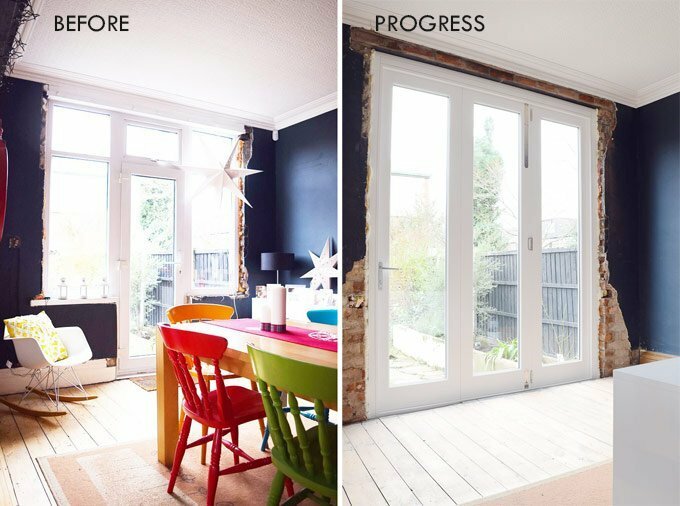 What do you think – was it worth spending extra on bi-fold doors? 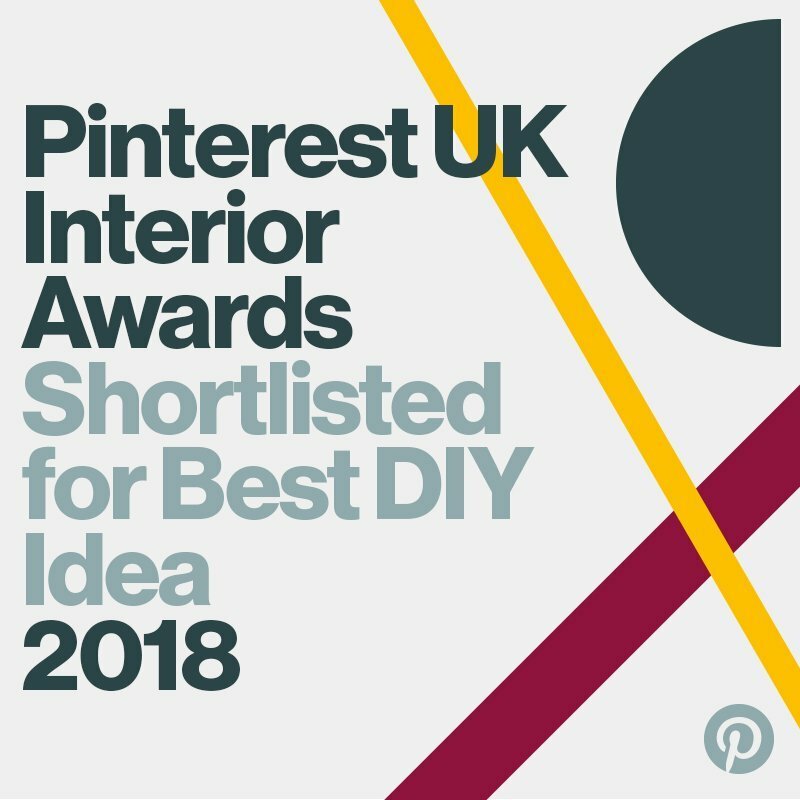 We’re of course planning on building the decked area ourselves and we’d love to know if you have any tips for us! I’m so glad you went for wood over UPVC. It will give you pleasure to look at every day. Thanks Mike. Even if we’d wanted to, we couldn’t have opted for uPVC because of the height. Either way, I totally agree that timber is much much better than uPVC. 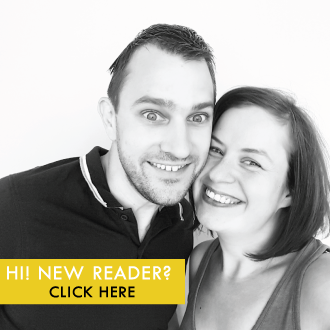 Oh wow what a difference – looks totally epic! So smart, what a great turn of luck that you could get the even threshold after all. Definitely worth the splurge you’re going to enjoy them so much! Thank you Lucy! It’s weird how different it feels. We obviously knew how big the opening would be, but it still feels so much better than expected! Christine, what a transformation! Congrats on the completely worth-it change (and great post describing the challenges and process). 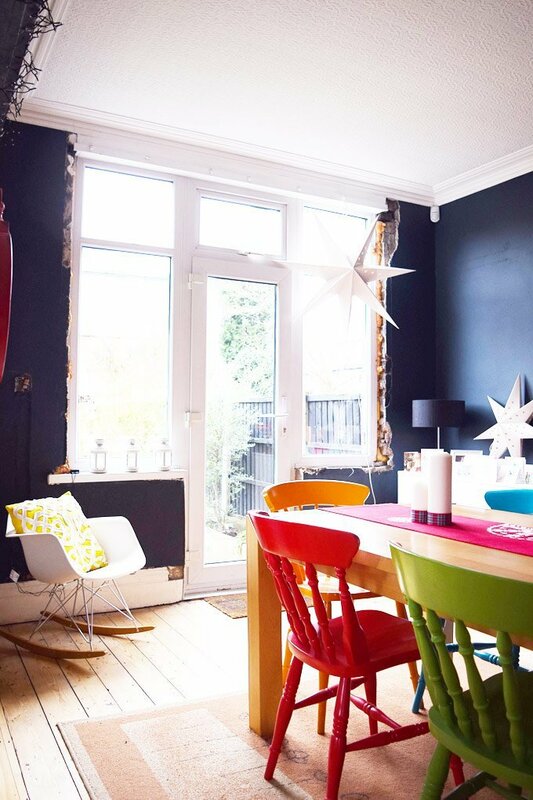 Looks amazing – already its like your view out the door is nicer LOL. I did a deck from doors and everyone just loves it. Improving the garden has jumped right to the top of our to-do list! 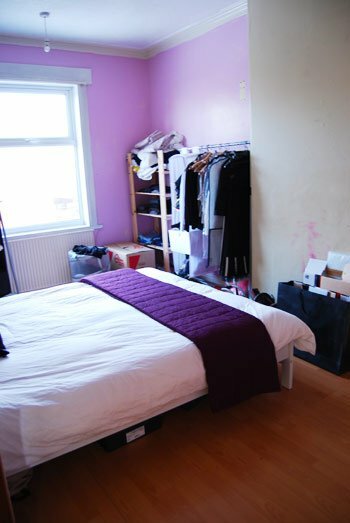 It’s still such a mess, but I totally agree with you about the possibilities Louise – it could be lovely! Thanks Lins! At least this is a home improvement where we can actually see where we’ve spent our money and we feel that it was worth it! 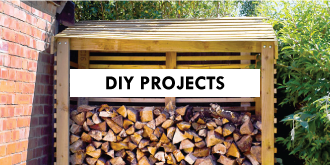 The worst projects are the ones where you spend, spend, spend and nothing looks different! It looks great. Your setup is very similar to our sitting room with a patio door. We need to think about a replacement, so this has given me some ideas. Would you mind saying how much it cost, including labour. Did you use a local firm, how many quotes did you get? 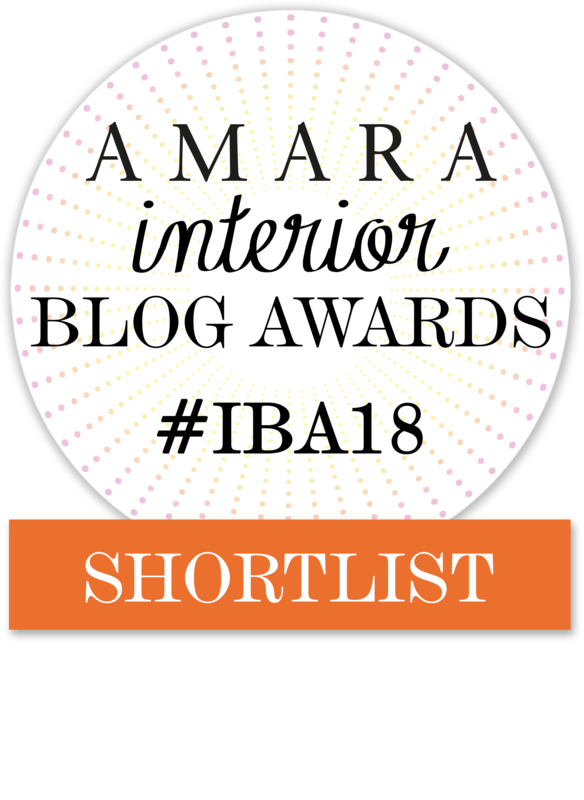 Many thanks still enjoying the blog. Thanks Lorraine! We got 5 quotes (some of which were for aluminium doors) and in the end we went with a local joinery. All together the project came in at £4000 of which the doors were £3500. French doors would have cost less, but we are glad that we went for the bifold doors and do think that the extra was worth it. Thanks! We love how they turned out!